Microsociologists seek to capture social life as it is experienced, and in recent decades no one has championed the microsociological approach more fiercely than Randall Collins. The pieces in this exciting volume offer fresh and original insights into key aspects of Collins’ thought, and of microsociology more generally. The introductory essay by Elliot B. Weininger and Omar Lizardo provides a lucid overview of the key premises this perspective. Ethnographic papers by Randol Contreras, using data from New York, and Philippe Bourgois and Laurie Kain Hart, using data from Philadelphia, examine the social logic of violence in street-level narcotics markets. 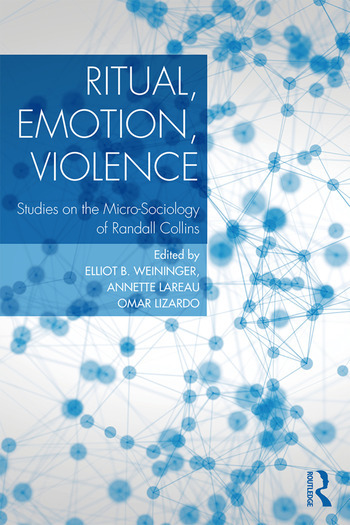 Both draw on heavily on Collins’ microsociological account of the features of social situations that tend to engender violence. In the second section of the book, a study by Paul DiMaggio, Clark Bernier, Charles Heckscher, and David Mimno tackles the question of whether electronically mediated interaction exhibits the ritualization which, according to Collins, is a common feature of face-to-face encounters. Their results suggest that, at least under certain circumstances, digitally mediated interaction may foster social solidarity in a manner similar to face-to-face interaction. A chapter by Simone Polillo picks up from Collins’ work in the sociology of knowledge, examining multiple ways in which social network structures can engender intellectual creativity. The third section of the book contains papers that critically but sympathetically assess key tenets of microsociology. Jonathan H. Turner argues that the radically microsociological perspective developed by Collins will better serve the social scientific project if it is embedded in a more comprehensive paradigm, one that acknowledges the macro- and meso-levels of social and cultural life. A chapter by David Gibson presents empirical analyses of decisions by state leaders concerning whether or not to use force to deal with internal or external foes, suggesting that Collins’ model of interaction ritual can only partially illuminate the dynamics of these highly consequential political moments. Work by Erika Summers-Effler and Justin Van Ness seeks to systematize and broaden the scope of Collins’ theory of interaction, by including in it encounters that depart from the ritual model in important ways. In a final, reflective chapter, Randall Collins himself highlights the promise and future of microsociology. Clearly written, these pieces offer cutting-edge thinking on some of the crucial theoretical and empirical issues in sociology today. Chapter 3. Interaction Ritual Threads: Does IRC Theory Apply Online? Chapter 8. What has Micro-Sociology Accomplished? Elliot B. Weininger is Associate Professor of Sociology at SUNY College at Brockport. He has published on the theoretical foundations of the concept of social class, as well as cultural and social capital. More recent work has addressed the ways that parents select schools for their children in districts with school choice programs and the role of schooling considerations in families’ residential mobility. Annette Lareau is the Stanley Sheerr Professor in the Department of Sociology at the University of Pennsylvania. She is the author of Home Advantage and Unequal Childhoods. She is currently writing a book about ethnography. Omar Lizardo is Professor of Sociology at the University of Notre Dame. His research deals with various topics at the intersection of the cognitive social sciences, culture and consumer studies, network science, and social theory.